1. Should I Sell My Property at Auction? People used to believe that selling property at auction was only for those in a financial bind, but that’s simply not true. Auctions are fun, fast, and transparent, taking the guesswork out of the selling process. With an auction, you’ll get fair market value for your property, know the exact date of the sale, and have your money in about 45-60 days. Auctions also simplify the property sale. The property will be sold “as-is”, with all sales final. There are no warranties, post-sale inspections, or contingencies. You don’t have to invest a lot of time or money preparing your property for sale. Bidders only bid if they’re prepared to buy, and the sale is for “cash”, so you’ll get a down payment as soon as it’s sold. 2. What Does An Auctioneer Do? West Central Auction Company has experience with a wide variety of auctions including farmland, livestock, antiques, commercial property, and more. The auctioneer is your partner through the entire auction process, from preparation to marketing, day of sale, and closing details. Choosing the right auctioneer is a critical step. You need an auctioneer who has integrity, knows the market, and can get qualified buyers to the auction. 3. How Can I Get the Best Price at Auction? There are many factors that contribute to auction price, but first consider whether you prefer an absolute auction or a reserve auction. In an absolute auction, the highest bidder gets the property regardless of the bid. This type can attract more bidders with the possibility of a good deal, and the increase in bidders can potentially bring in a bigger price for your property. In a reserve auction, you’ll set a reserve price before the sale, which is the minimum price you will accept for your property. This option is a conservative choice, especially in an unstable selling environment, but could result in a lower final price if less interest is generated. Also, if the reserve price isn’t met and you decide not to sell, there may be “no-sale” fees owed to the auctioneer. West Central Auction also offers a “multi par,” or multi parcel, approach on online property auctions. This approach enables land to be subdivided as the auction proceeds and bidders can bid on the whole property, individual parcels, or various combinations. This is a dynamic approach that helps maximize the value of the property by highlighting the unique features of individual parcels. We have touched on a few important things to think about here, but be sure to discuss all the options in detail with your auctioneer. By choosing the right auctioneer and doing your research, an auction can simplify your property sale and get you the proceeds quickly. 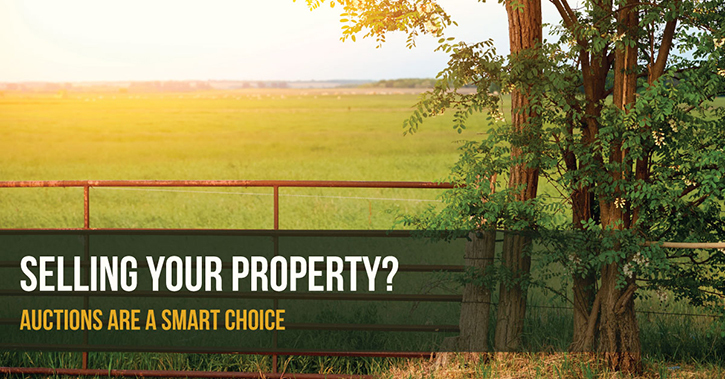 Contact West Central Auction Company for more information on how selling your property at auction could be the right choice for you.